We report an indipendent discovery of a new nova in M33 (ASAS-SN15th) made by Bassano Bresciano Observatory on behalf of Italian Supernovae Search Project (ISSP). See discovery image (and ATEL). Also we reported classification ATEL. During the ongoing All Sky Automated Survey for SuperNovae (ASAS-SN or "Assassin"), using data from the quadruple 14-cm "Brutus" telescope in Haleakala, Hawaii, we discovered a new transient source, most likely a nova, in the nearby galaxy M33. 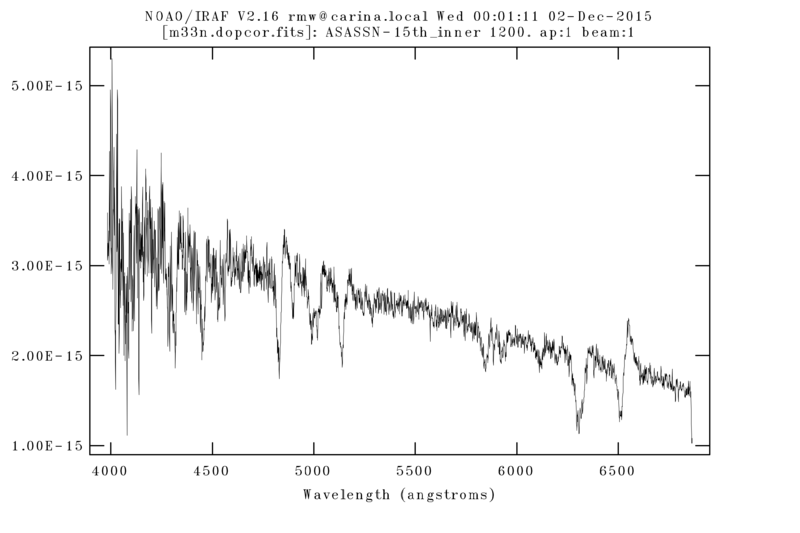 ASASSN-15th was discovered in images obtained on UT 2015-12-01.40 at V~16.5 mag. We do not detect (V>17.1) the object in images taken on UT 2015-11-30.41 and before. An image obtained by S. Kiyota on UT 2015-12-01.51 with a 25-cm telescope at Kamagaya, Japan, confirms the discovery of the transient. This figure shows the archival SDSS g-band archival image (left) and the S. Kiyota V-band confirmation image (right). The red circle has a radius of 15" and is centered on the position of the transient in the S. Kiyota V-band confirmation image. We thank LCOGT and its staff for their continued support of ASAS-SN. ASAS-SN is supported by NSF grant AST-1515927, the Mt. Cuba Astronomical Foundation, the Center for Cosmology and AstroParticle Physics (CCAPP) at OSU, and the Robert Martin Ayers Sciences Fund. For more information about the ASAS-SN project, see the ASAS-SN Homepage and the list of all ASAS-SN transients. We obtained a low-resolution optical spectrum of ASASSN-15th (ATel #8349) on UT December 2.3 with OSMOS mounted on the MDM 2.4m telescope. The spectrum shows Balmer, Fe II (multiplets 42, 48, 49, and 74), and Na I D emission lines exhibiting P Cygni-type line profiles superposed on a blue continuum. After correcting for the redshift of M33 (z=-0.000607, Karachentsev et al. 2013, AJ, 145, 101), we measure a terminal velocity of the H-alpha absorption of -3500 km/s. The FWHM of the H-alpha Gaussian emission component is about 2580 km/s so the average expansion velocity is about 1290 km/s. The spectrum is consistent with an Fe II-type nova in M33 caught early.